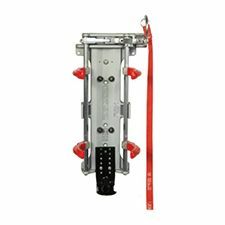 The Positive Locking Mechanical WALKWAY bracket meets NFPA-1901-09 9G dynamic requirements for cylinder restraint system for use in crew compartments. Third party tested to 10G. Holds listed self-contained breathing apparatus so it's ready to use. It has four PVC coated clamping arms to securely lock the SCBA in place without damaging the cylinder wall. The basic bracket and clamp arms are made of strong, yet light-weight aluminum alloys. Hex arms and operating lever are plated steel to withstand years of constant use. Donning the SCBA is fast and easy. Firefighter simply slips into the harness, pulls up on the cam-operated release lever, and and is ready to go. For different cylinders, the clamp arms are easily changed to accommodate the new cylinder. Per price each, 4 are required per bracket. These specially designed Mechanical WALKAWAY brackets have an adjustable footplate. They are designed to be used "upside-down" in SCBA seating. The air cylinder rests upon our model NF long footplate. Brackets come standard with a nylon pull release strap which may be replaced by the optional pull release cable or the release cord.